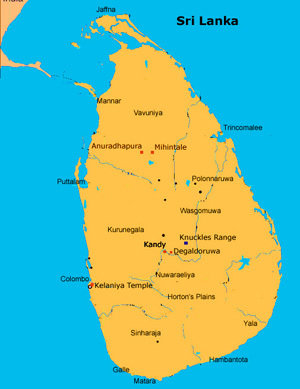 Being a tropical island, Sri Lanka has two monsoons during a year. 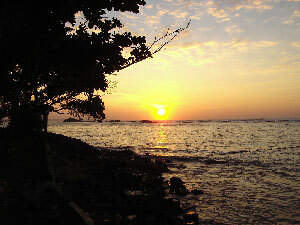 Even having two monsoons as well as two inter monsoons, the Island has good weather and sunshine in some part of the island most of the time. 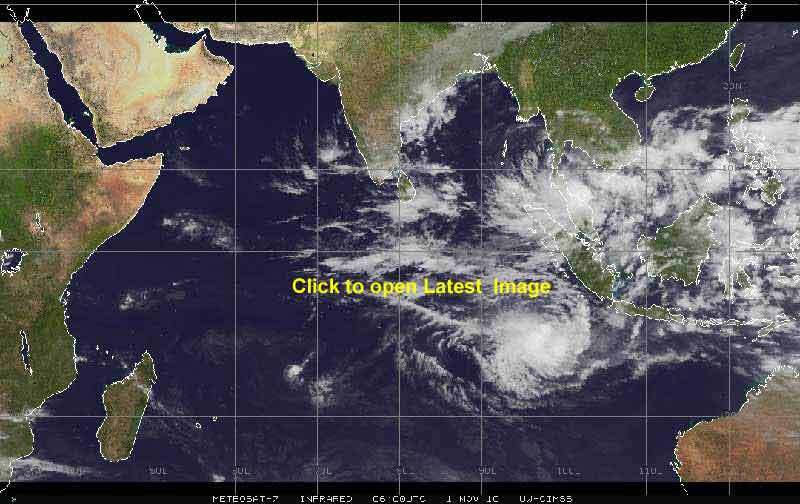 From May to October, there is southwest monsoon which gives ample rain to southwest part of the island and the northeast monsoon brings rain from the eastern coastal region from December to March. The traveller will be counting on good weather for sight seeing and travelling , as good weather will make him stick to his travel plans and the travelling to be more pleasurable. 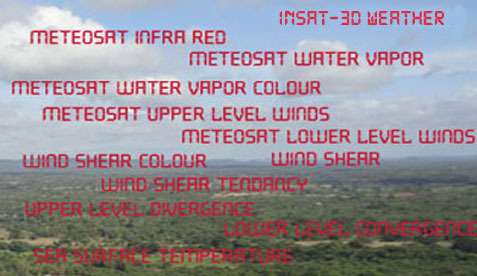 For making the traveller more informative on the island's weather conditions, this information page was created, making use of the freely available Hi-Tech Satellite Weather Images by METEOSAT-7, provided courtesy of Cooperative Institute for Meteorological Satellite Studies / University of Wisconsin-Madison Space Science and Engineering Center. 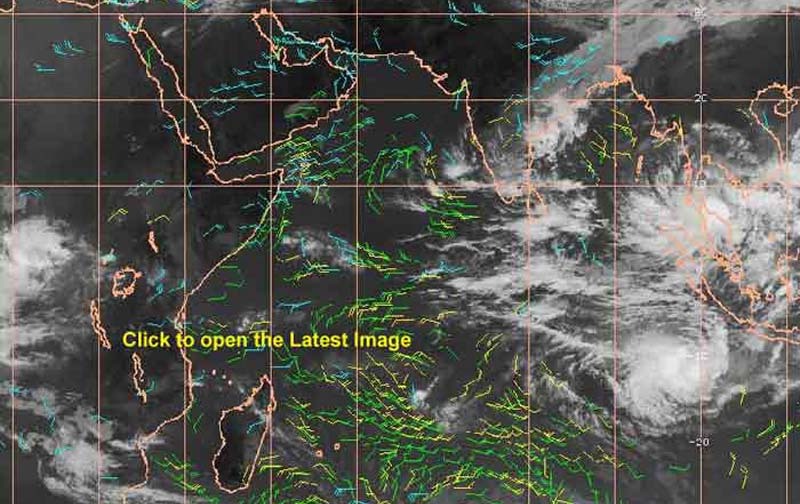 These satellite weather maps gets updated once in every three hours. 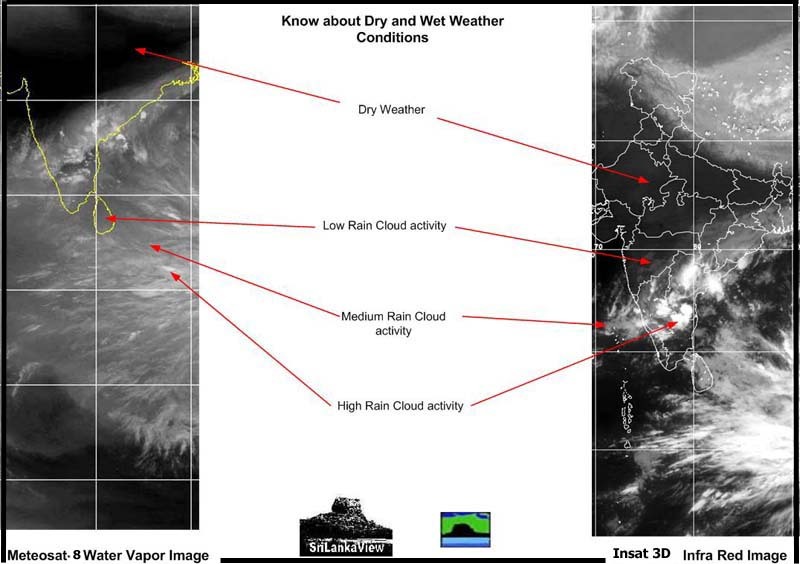 Another link also is available for Indian Insat 3D satellite weather imaging which also gives InfraRed and Water Vapor Weather maps of the region which gets updated every half an hour. 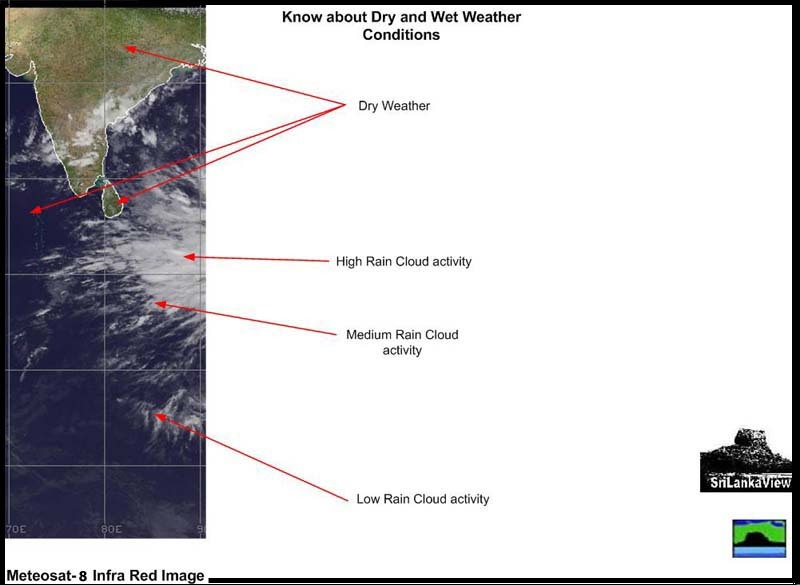 A basic knowledge on how to identify the rain clouds on a map showing Sri Lanka and the Indian Ocean, will enable the visitor to know exact weather conditions at the moment and the possible weather pattern for the next day or may be more. Example maps with readings are given for easy understanding. 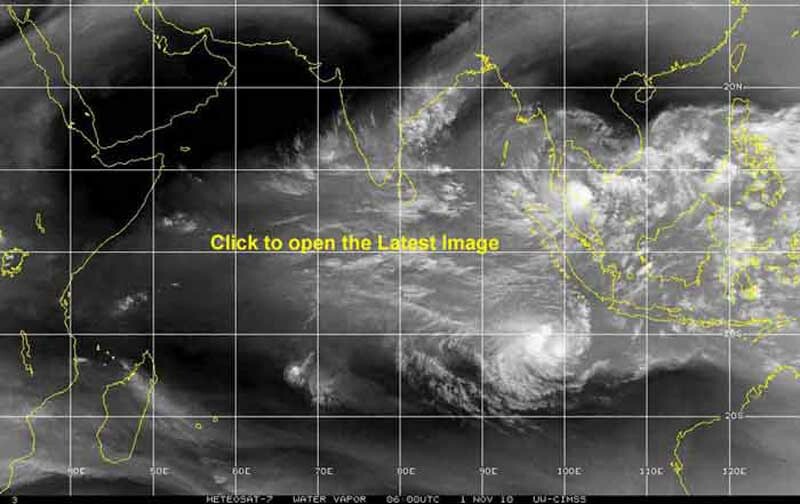 Anyone like to study the topic in detail can visit the Web sites of University of Wisconsin-Madison Space Science and Engineering Center and Indian Meteorological Department's web sites which opens up for Weather maps linked here. Learn to self analyze a Satellite Weather Map quickly to obtain an accurate Weather Report by yourself, just by going through this tutorial. Its so easy. 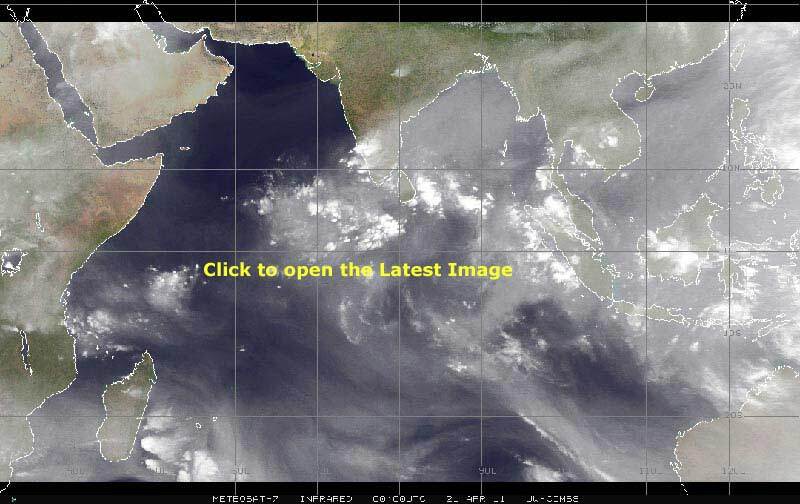 The enlarged Sri Lanka map can be seen here with India in the north west direction and blue coloured Indian Ocean surrounding the island.The cloud like formation appearing in white is the probable rain clouds covering the south east section of the island. 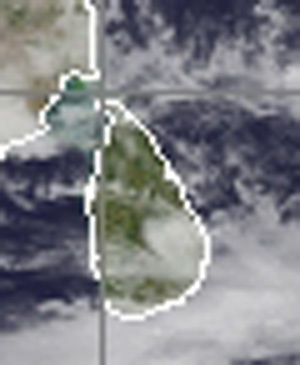 A bigger cloud formation is already at the southern section of the island so the rain cloud activity will be there for the southern part of the island for few more hours. The island is 268 miles lengthwise and 139 miles across at it's maximum width. We can know the wind speeds from the data maps provided and can assume roughly how much time a rain cloud covers the territory or the approach of a rain cloud and also a rough idea of the rain cloud size, compared to the size of the island. UTC (Universal Coordinated Time), was previously called as the Greenwich Mean Time and is the local time at Greenwich-England, which is at 0° longitude. 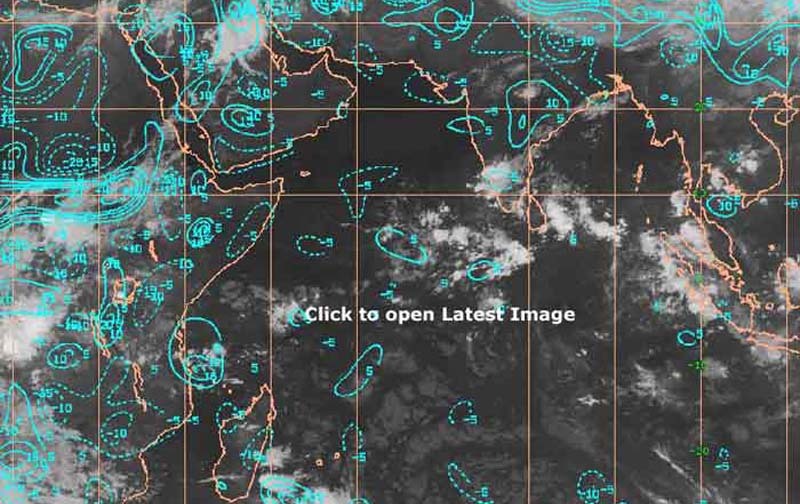 Meteosat-7 Images marks the time of the image in UTC. 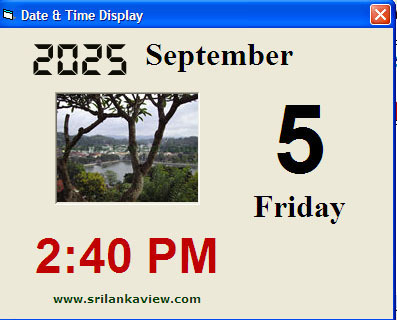 Add 5 Hours and 30 Minutes to the UTC Time to get the Sri Lankan time of the image. 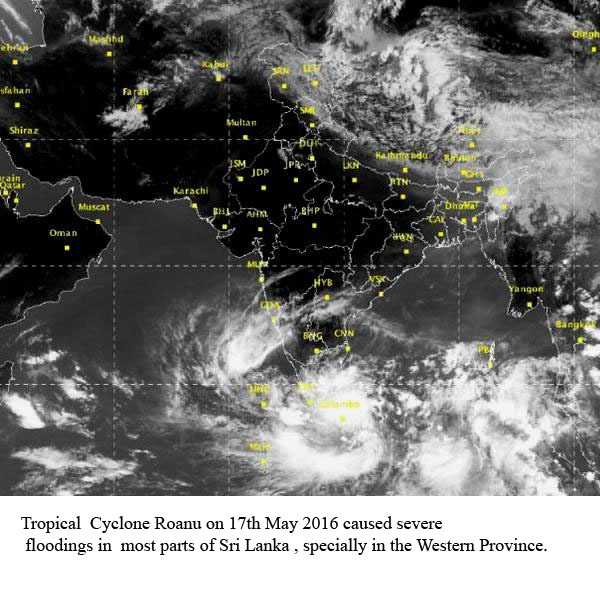 Below is the image from the Meteosat -7 Weather Satellite in which the part of Sri Lanka was enlarged as shown in the above leftmost figure. It is an Infra Red Image of the major area of the region. 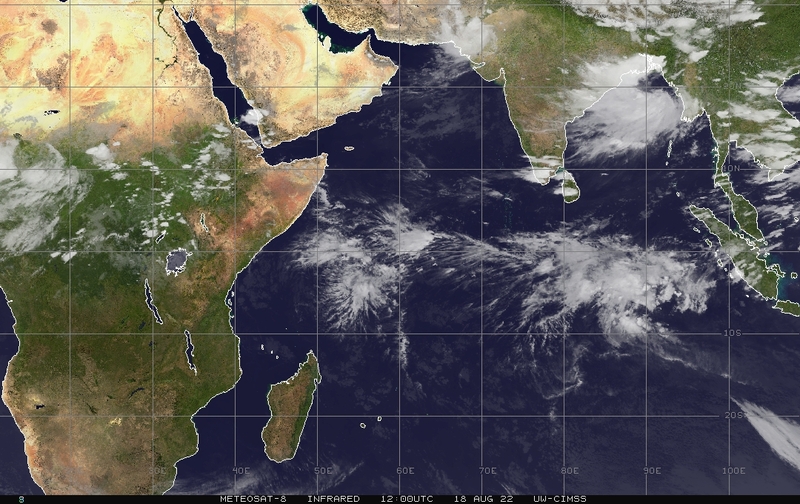 The whole of south east asian region is having wet conditions as can be seen here for some time. 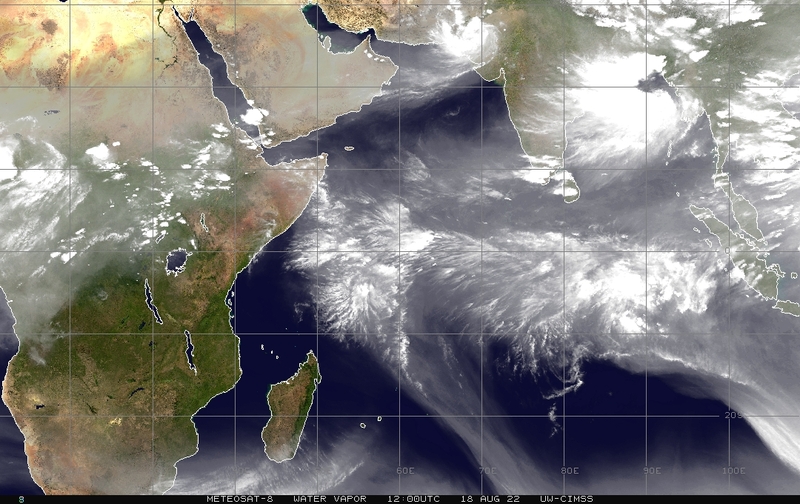 Below is an Water Vapor image of the same region at the same time as above taken from the Meteosat-7 Weather Satellite. Normally water vapor images show how moist or dry the middle and upper atmosphere is. The air circulation in the middle and upper atmosphere also can be noticed Water Vapor images can be taken during daytime only. Infra Red images can be taken any time of the day. 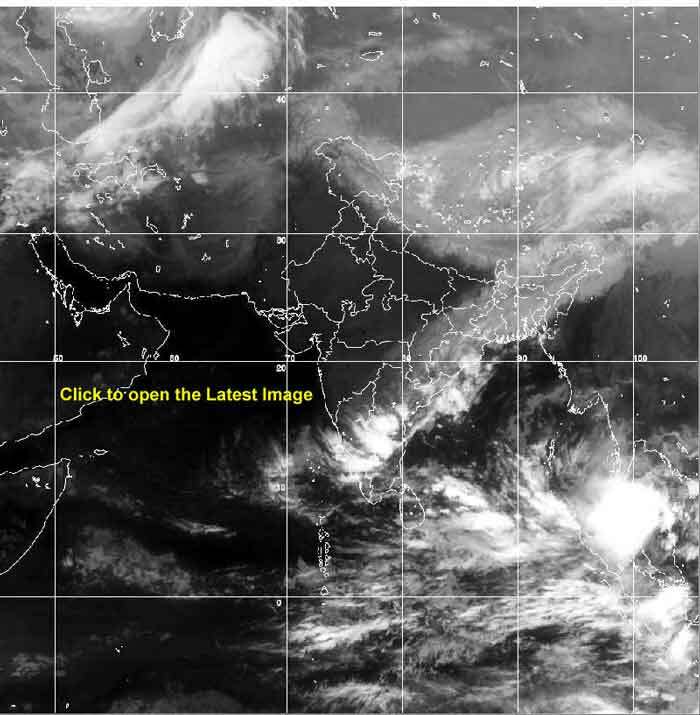 Click the image below to open up the latest Insat 3D Indian Satellite's Infra Red Weather Map. 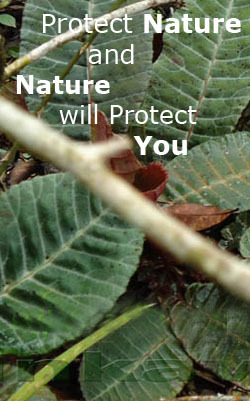 Click the Back Button of the Browser to return to this page. Image gets updated every half an hour. 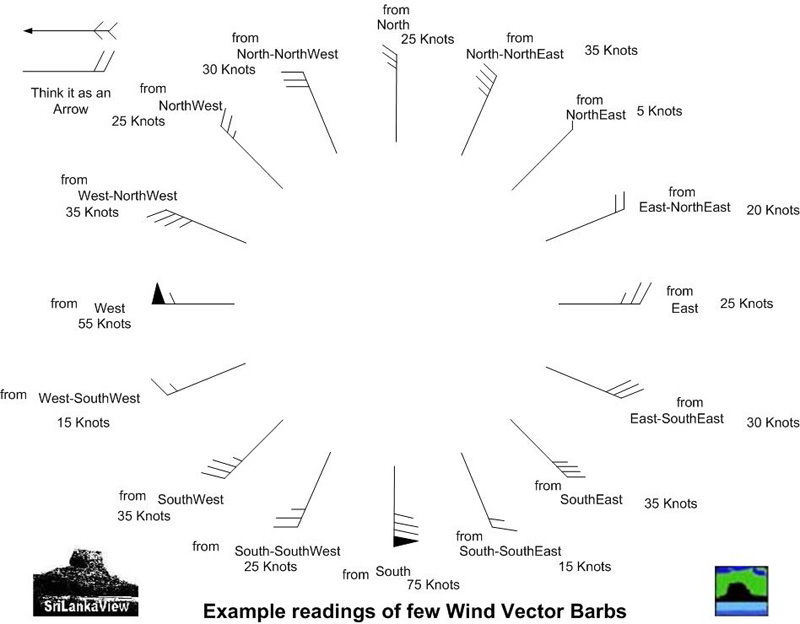 Atmospheric Motion Vectors (AMV) indicate winds in Upper layers of the atmosphere. The photo shows wind effects of 3 layers of the atmosphere by the three colours used. The blue colour is for winds in the region [100-250 mb pressure] , corresponding to 45000 feet and 34000 feet above sea level. The yellow colour is for winds in the region [251-350 mb pressure] corresponding to 34000 feet and 26500 feet above sea level. The green colour is for winds in the region [351-500 mb pressure] corresponding to 26500 feet and 18000 feet above sea level. These are helpful to notice concentrated Upper Level Divergence of the Winds. Atmospheric Motion Vectors (AMV) indicate winds in Lower layers of the atmosphere. The photo shows wind effects of 3 layers of the atmosphere by the three colours used.The blue colour is for winds in the region [400-599 mb pressure] , corresponding to 20000 feet and 14000 feet above sea level. The yellow colour is for winds in the region [600-799 mb pressure] corresponding to 14000 feet and 6000 feet above sea level. The green colour is for winds in the region [800-950 mb pressure] corresponding to 6000 feet and 1500 feet above sea level.These are helpful to notice concentrated Lower Level Convergence of the Winds. 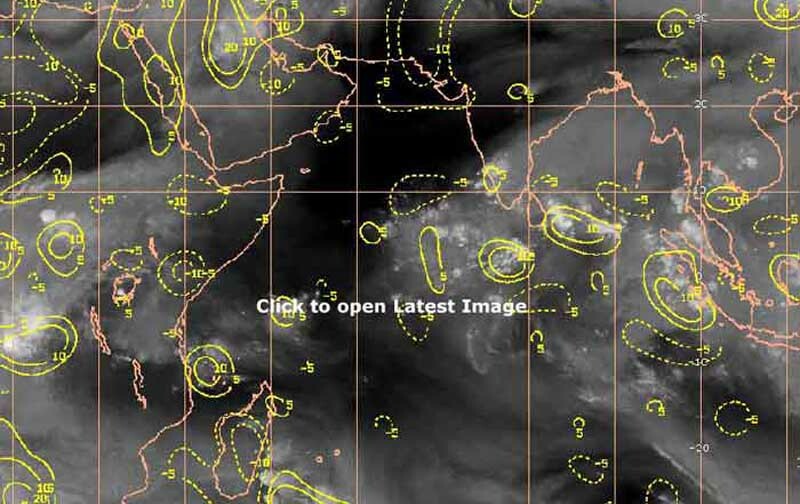 Wind Shear charts come in handy when there is Tropical Cyclone activity in the region. Wind Shear is the net result of the change of speed or direction of wind speed along a straight route of its travel and the result is given in Knots.Here the Upper Wind is taken at a range of 150-300 mb range which corresponds to an average of about 40,000 feet above sea level and the Lower Wind is taken at a range of 700-925 mb range which corresponds to an average of about 5000 feet above sea level. 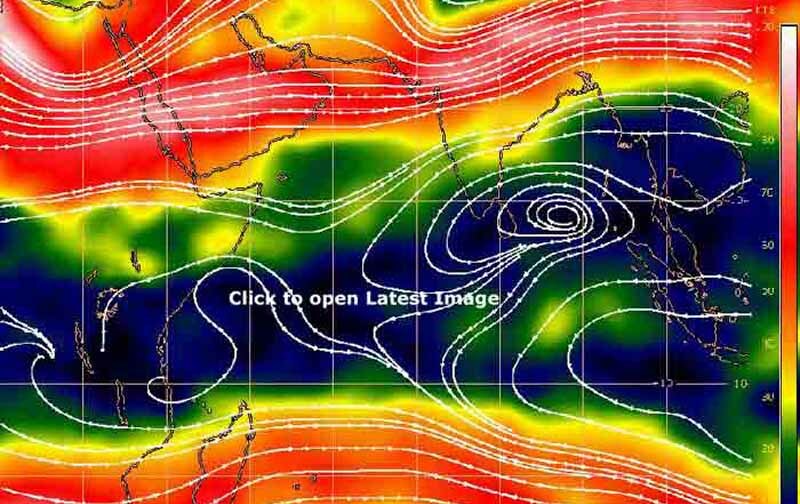 Low Wind Shear Values of around 5 knots are bad if they appear near Cyclone or Hurricane activity, since low values can intensify the activity of the Cyclone. Higher figures like 40 Knots or more will dissipate the Hurricanes power and makes it less destructive. 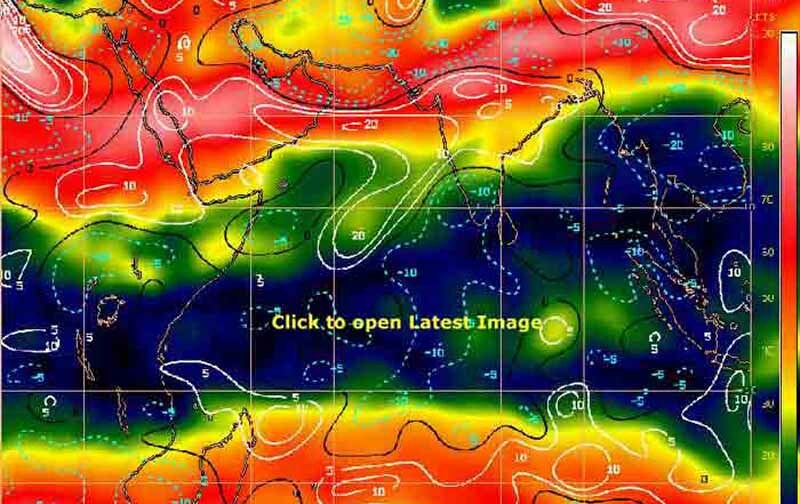 The Coloured Bar at the right indicates the corresponding Wind Shear values in Knots, which in turn shows Hi and Lo Wind Shear Values in the whole region. 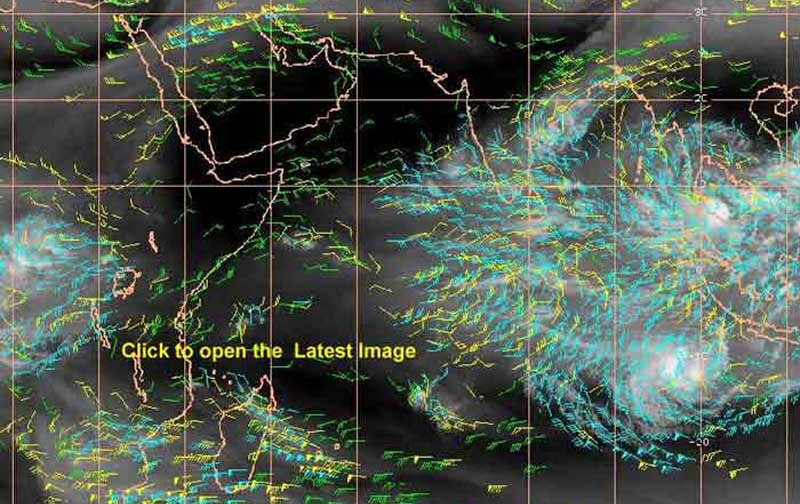 Wind Shear charts come in handy when there is Tropical Cyclone activity in the region. 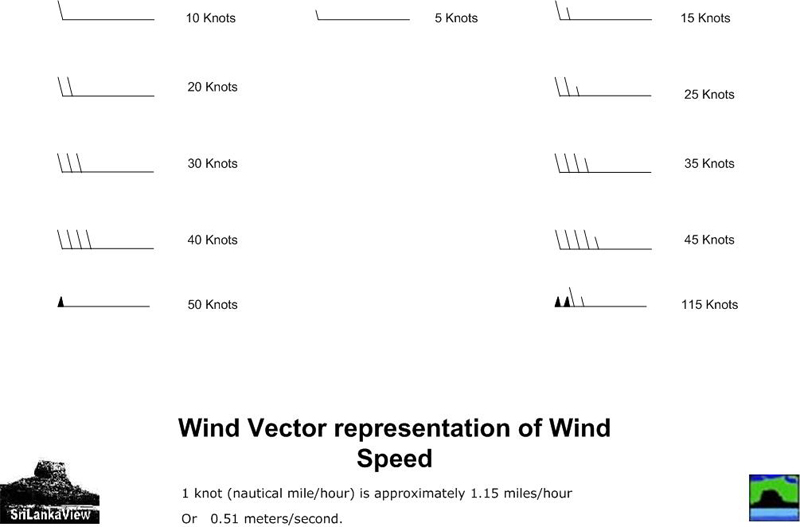 Wind Shear is the net result of the change of speed or direction of wind speed along a straight route of its travel and the result is given in Knots.Here the Upper Wind is taken at a range of 150-300 mb range which corresponds to an average of about 40,000 feet above sea level and the Lower Wind is taken at a range of 700-925 mb range which corresponds to an average of about 5000 feet above sea level. 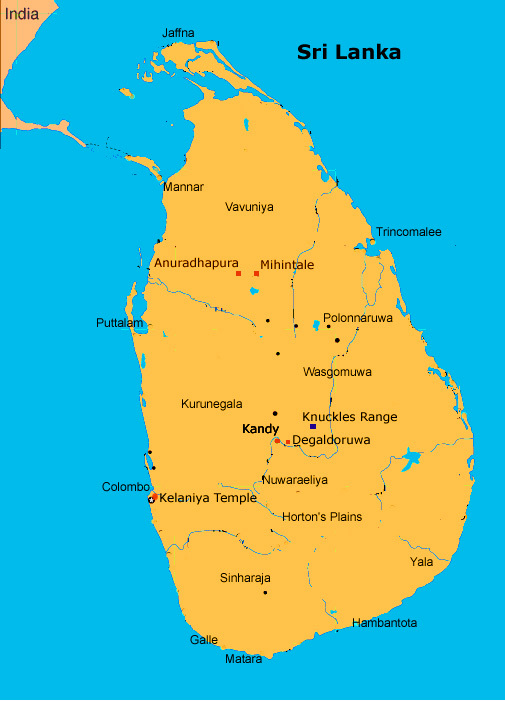 Looking carefully at the Chart will show you the land mass demarcated in White which shows, Sri Lanka, India, South East region ,the Gulf and a part of Africa. 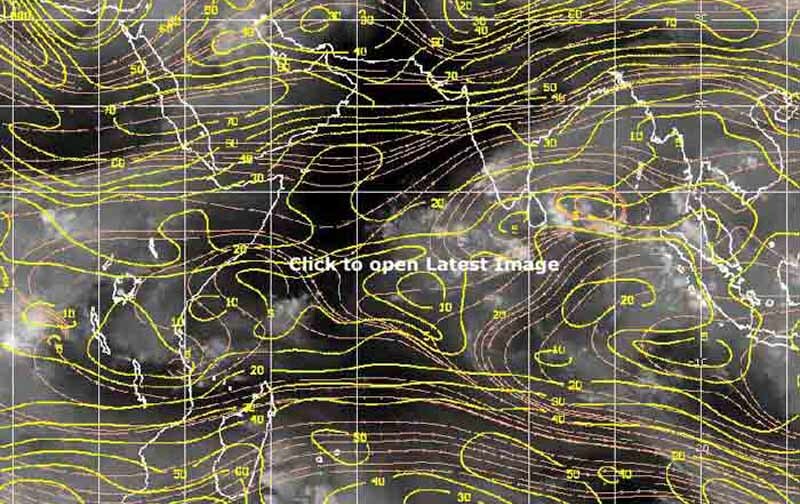 Yellow contours indicate the corresponding numerical value in Knots of Wind Shear in that area.The direction of the Shear is indicated by the arrow directions of the Pink lines. Normally it is an indication of the Upper Level wind direction also. This map indicates the trend of the Wind Shear valves, by indicting in contours of White solid lines, the trend of the incremental values in Knots and by Blue dashed lines, the tendency of decreasing values of the Wind Shear in Knots. This map shows the Upper level of the troposphere , around 40,000 feet up from the sea level. Moving away from a common point to different other directions can be explained as Divergence. The Wind coming up from the Lower Level Convergence rushes up and In the Upper layer, they move away to other directions. If there are concentrated rings like contours, which also in the same placement of a concentrated Lower Level Convergence, then there is a possibility of a formation of a Tropical Storm or a Hurricane. Increasing values are given in solid Yellow contours and decreasing values are given in dashed Yellow contour lines. This map shows the Lower level of the troposphere , around 5000 feet up from the sea level. Coming closer to a common point can be explained simply as Convergence. The air at lower level gets concentrated to a smaller area and moves upwards in this instance. In the Lower layer , if there are concentrated rings like contours, which also in the same placement of a concentrated Upper Level Divergence, then there is a possibility of a formation of a Tropical Storm or a Hurricane. Increasing values are given in solid Blue contours and decreasing values are given in dashed Blue contour lines. 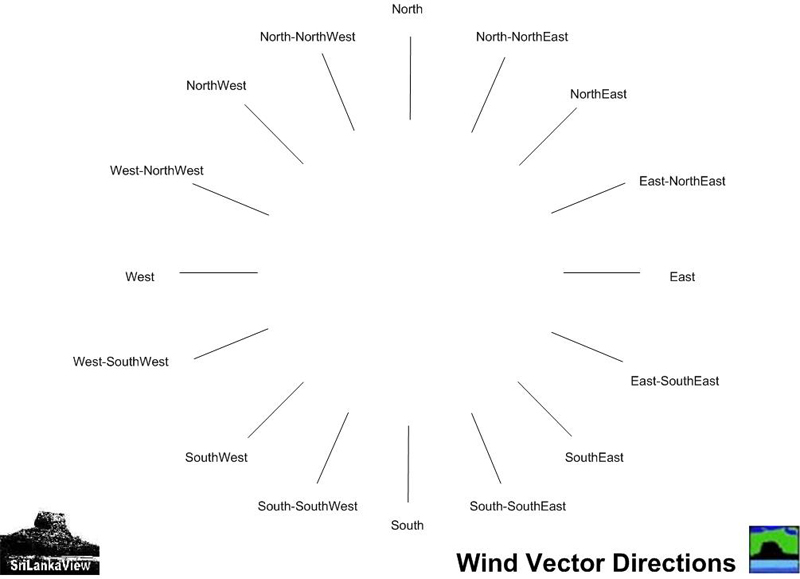 These symbols [ Wind Vector Barbs] will tell you to which direction the wind will take the clouds, so you will have a first hand idea on the weather play in the region.